The continuing flow of updates from AMD, to further optimise and enhance Ryzen processors, are welcome to see. AMD's community updates since the Ryzen launch, penned by Technical marketer Robert Hallock, are of particular note. Yesterday Hallock published the fourth such update since the launch of Ryzen. The big feature being trumpeted this time around is the upcoming AGESA v1.0.0.6 update which will provide better handling of overclocked RAM on the Ryzen platform. Current motherboard BIOS files from AMD partners are based upon AGESA v1.0.0.4. If you don't already know, AGESA is an acronym for 'AMD Generic Encapsulated System Architecture', and it is important core of the BIOS which initialises AMD x86-64 processors during boot time. AGESA v1.0.0.6 began beta testing earlier in May and is nearing release candidate status for third parties to start implementing in regular BIOS updates. 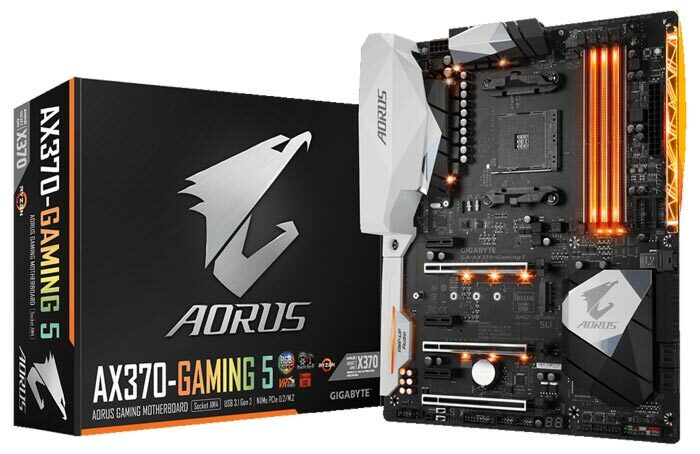 Meanwhile some motherboards, like the Aorus pictured below, are already compatible with public beta BIOS files based upon AGESA v1.0.0.6. With the AGESA update to 1.0.0.6 applied you should experience improved RAM module support and greater reliability, according to Hallock. AMD has added "26 new parameters that can improve the compatibility and reliability of DRAM, especially for memory that does not follow the industry-standard JEDEC specifications." In the community update there is a table listing these 26 parameters if you are interested in the minutiae. To summarise the benefits to be gained - it will be more straightforward to use DDR4-3200 modules or faster on Ryzen platforms. Another improvement in AGESA 1.0.0.6 is fresh support for PCI Express Access Control Services (ACS) which will be a boon to virtualisation. Hallock states that the fresh ACS support will be especially useful for users that want 3D-accelerated graphics inside a virtual machine. For example in a 2x GPU equipped machine "a host Linux OS and a Windows VM both can have dedicated graphics cards," providing near-native performance. In one other AMD news nugget today, the firm has announced its hour-long press conference and webcast schedule at Computex. The event begins on Wednesday, 31st May, 2017 at 10 a.m. Taiwan time, that's 3 a.m. here in the UK. AMD will be highlighting its "new products and PC designs" and sharing "never-before-seen hardware demonstrations". Sweet, 4GHz RAM and PCIe ACS! I really want to know what the wartning is at the end of the blog. Sounds nasty. Added dividers for memory clocks up to DDR4-4000 without refclk adjustment. 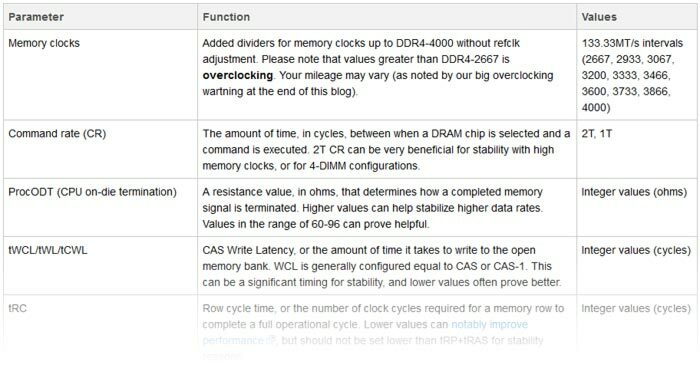 Please note that values greater than DDR4-2667 is overclocking. Your mileage may vary (as noted by our big overclocking warning at the end of this blog). Apparently anything more than DDR4-2667 is overclocking which is a little odd. If your RAM is rated at 4000 and your system has the physical option adjust it to that provided by the manufacturer I'm sure it can argued that it's a function provided as is. So therefore if your system were to break when setting that manufacturer provided setting and they didn't replace your goods I bet it could stand up in court. You don't provide a function that can damage your cooker that a user can easily use? Isn't it the usual to state the native speeds and higher speeds are overclocking, looking at Z270 boards they say the same. This is only good news, just hoping this leads to 64gb at 3000mhz being possible for my next build. Apparently anything more than DDR4-2667 is overclocking which is a little odd. The ram may be specced to run faster, but faster ram puts more stress on the memory controller in the CPU. The memory controller is only specced to run the ram at up to 2667.